Federal Reserve is exacerbating the fiscal cliff. WASHINGTON, DC - NOVEMBER 27: Federal Reserve Board Chairman Ben Bernanke makes welcoming remarks to student competitors during the National College Fed Challenge Finals at the Federal Reserve November 27, 2012 in Washington, DC. Neil Irwin argues that the Federal Reserve can’t counteract the impact of going over the fiscal cliff, which I think is correct in practice though it’s possible things would be different under a whole different monetary policy paradigm. But the central bank does have some influence over the outcome that can be used for better or for worse. And unfortunately they’ve been using it for worse. Far and away the most valuable thing the Fed could be doing right now is trying to keep people’s nominal expectations anchored. Even a very skilled pilot can’t promise you that he’ll steer so cleverly that you never notice the turbulence. But you expect a pilot to say that he’s going to steer the plane to your destination, whatever happens with the wind. When the flight crew thinks you’re likely to experience some transient turbulence they normally get on the intercom system and tell you that, and if unexpected problems arise they make note of them and try to reassure people. That’s because panic doesn’t help the situation. People need to know that the plane is sound, the pilot knows what he’s doing, and at the end of the day you’re going to land on the runway. The Fed’s ability to counteract the short-term impact of sharp spending cuts and tax increases in a depressed economy is very uncertain. But it’s also clear that the “fiscal cliff” doesn’t shake America’s long-term economic foundations in any particular way. A sensible central bank would be trying to offer reassurance on this score, urging congress to avoid the turbulence and temporary dislocation and the very real human hardship involved while still emphasizing that the Fed will do absolutely everything it can think of to keep medium-term nominal growth on track. 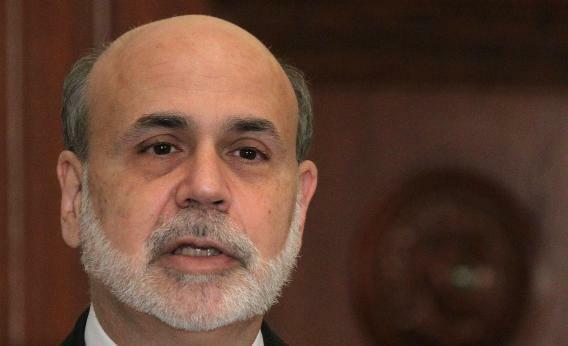 Instead, starting with coining the alarming and not-very-accurate metaphor “fiscal cliff” Ben Bernanke has been engaged in an effor to deliberately unsettle people’s expectations and spread alarm. I understand why he’s doing it. You can easily imagine a scenario where congress screws up and creates a huge fiscal drag, then Bernanke unleashes QE4 to try to counteract it and he’s partially successful. Then he’s going to take a double hit for “printing money” and presiding over poor economic performance. He’d much much rather that congress handle its business. In fact his first choice would be for congress to not just handle its business, but enact a large short-term stimulus paired with a huge long-term deficit reduction plan thus allowing him to stabilize nominal growth without doing any more asset purchases or novel communications strategies. So he’s tried to raise the alarm bells about the cliff and cheerlead for both stimulus and deficit reduction. It makes a ton of sense as a political strategy and I sympathize with his dilemma. But as Ben Parker says, with great power comes great responsibility. Ben Bernanke has the power to make the cliff better or worse. But to use it constructively, he needs to accept that off the people on the planet earth he holds far and away the largest share of responsibility for stabilizing nominal growth expectations in the United States of America.